Have you ever visited a place that you had no expectations about and it completely blew you away? Well that place for me was Hong Island, Thailand. It is no wonder that many people consider it one of the most beautiful islands in the region. I hate to say it, but I found Hong Island even more gorgeous (and less crowded) than the very popular Maya Bay. 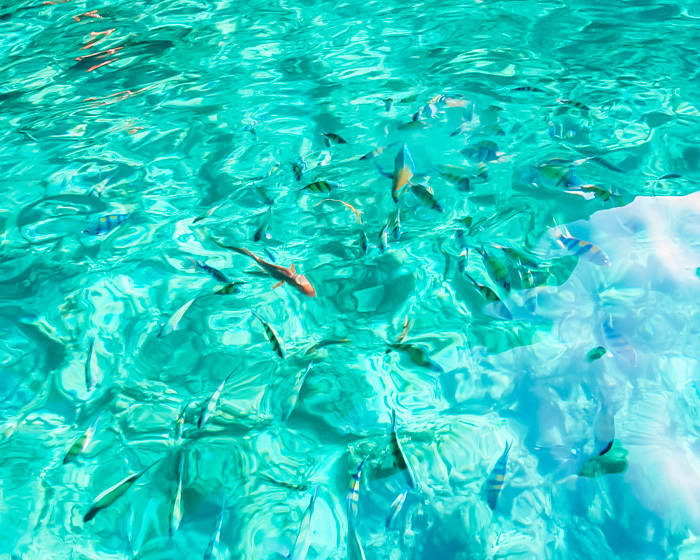 The water around the island is crystal clear and perfect for snorkeling and swimming. 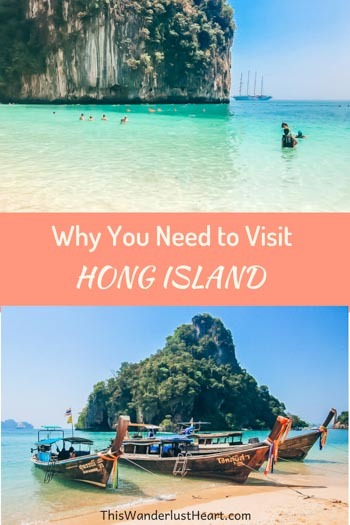 Keep reading to find out more about why you need to visit Hong Island! Hong Island, also known as Koh Hong, is located in Thanbok Khoranee National Park right off of the coast of Krabi. 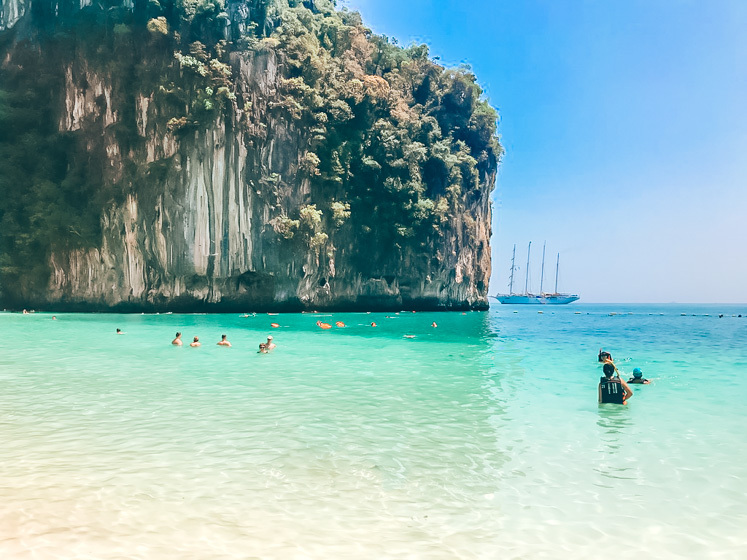 The island has been called ‘The Emerald of Krabi’s Sea’ because of its stunning scenery, beautiful lagoon, and amazing coral reefs. Hong Island is accessible from Phuket, Phang Nga, and Ao Nang all located in the providence of Krabi. There are several companies that offer day trip tours to the island. I organized my tour through my hotel directly in Ao Nang the day I arrived. Hong Island is located 20 minutes from Ao Nang by speedboat and 45 minutes by longtail. 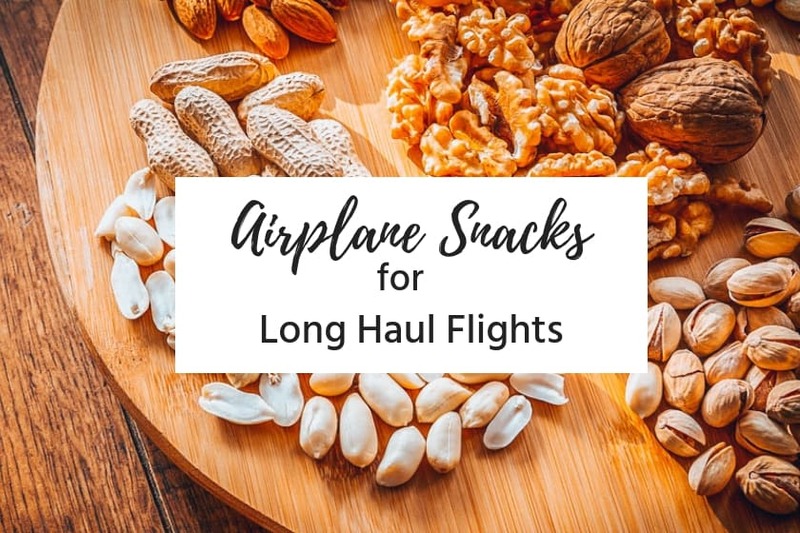 Looking for flights to Thailand? You can find the cheapest airfare here. From my hotel I was picked up by the tour operator around 9am and driven to Ao Nang beach where the speedboats were leaving for day trips to Hong Island and other neighboring islands. Once 8 people filled up our speedboat we were off. I really loved that it wasn’t a large group as it made for more of an intimate experience. Our group had our own boat driver and guide. Our first stop was to head through the Hong Island lagoon. This lagoon was simply drop dead gorgeous! As you approach the area going very slowly because of the low tide, you see the color of the lagoon make a dramatic change to a bright emerald green. It was nothing like I have ever seen before. 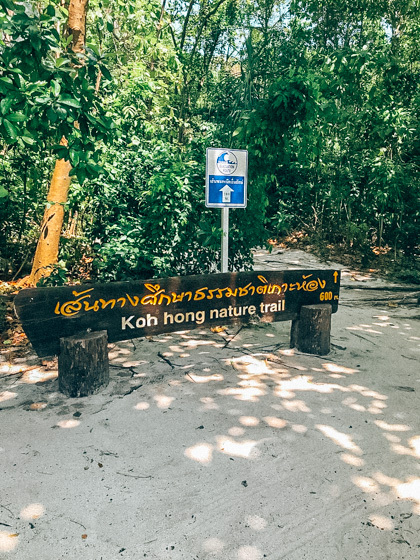 The impressive cliff passage is surrounded by mangroves and limestone formations. The tour operator stopped to allow us to take so many pictures of the memorizing surroundings. Next stop was to head to Thanbok Khoranee National Park. At the arrival on Hong Island, you are dropped off on the pier where you have to pay 400 baht for the entrance fee to the national park. This is not included in the price of the day tour. 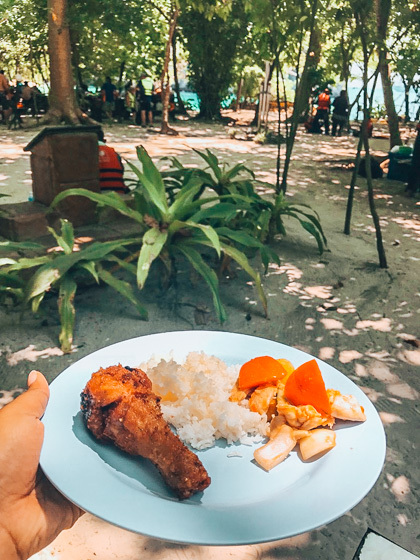 Lunch, however, is included and when we arrived on Hong Island we went straight to eat. They had fried chicken with rice and veggies waiting for us. It was so delicious! Eventually, after lunch you can straight head to the beach for some fun in the sun. The beaches at Hong Island are nothing short of breathtaking! There are two powdery white sand beaches lining twin bays. Each has calm and shallow water, nearly transparent enough to snorkel without putting your face underwater. You can see all the fishes swimming inches away. I spent the most perfect few hours swimming, relaxing on the beach, and reading a book. If I could have stayed there forever I would’ve. Nothing makes me happier than being on a beautiful beach and being in picture-perfect surroundings. Unfortunately, nothing lasts forever and it was time to go back to the boat to head back to Ao Nang. 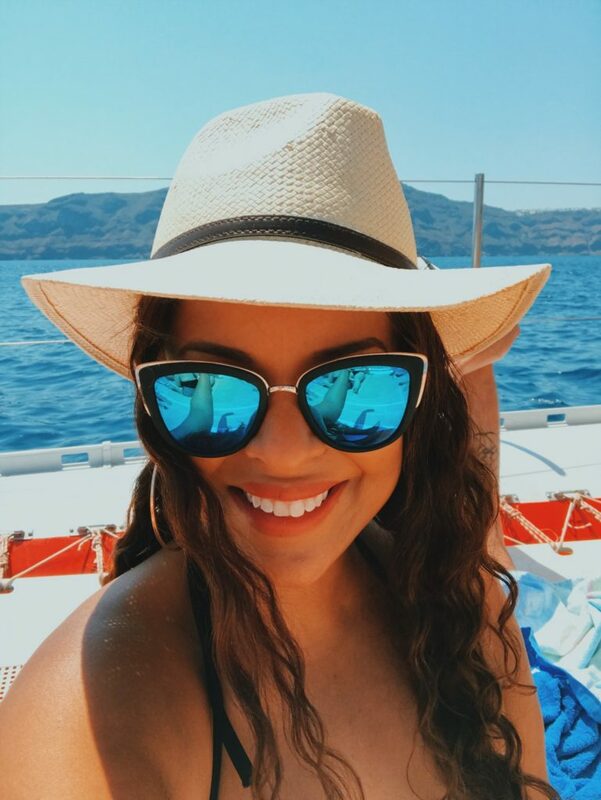 Insider tip: Wear sunglasses, sunscreen, hat or cap. 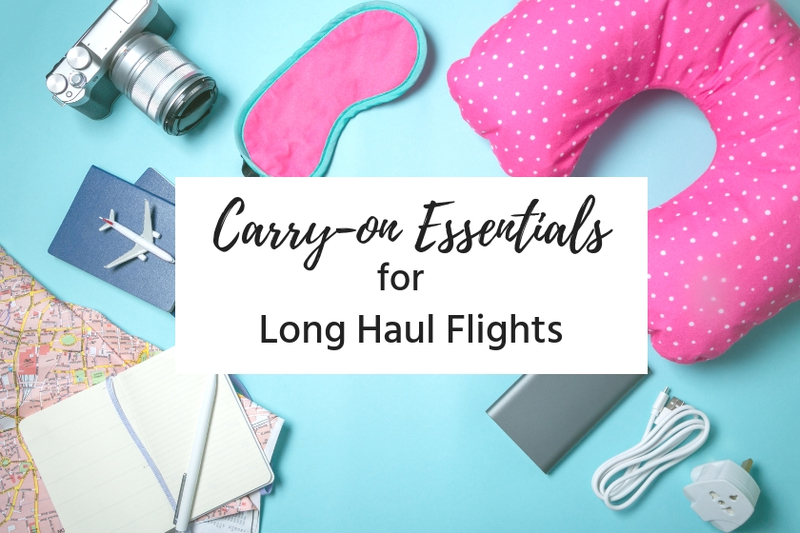 And don’t forget your towel, camera, and waterproof case! While I booked my Hong Island tour through my hotel, you can always book yours in advance and guarantee that you have a spot reserved. This is especially important in high season because the tours fill up quickly. If you don’t book in advance you could run the risk that the tour is full or not available while you’re there. 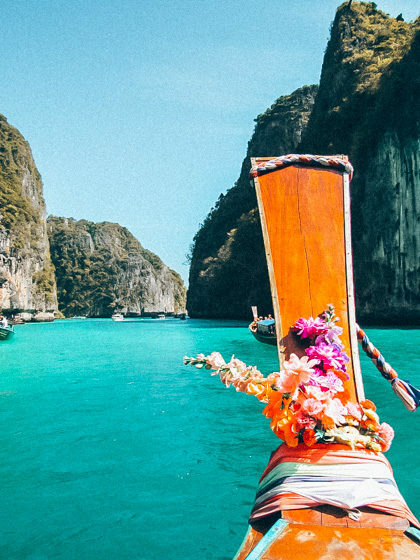 There are actually so many places you can take day trips to specifically from Phuket. 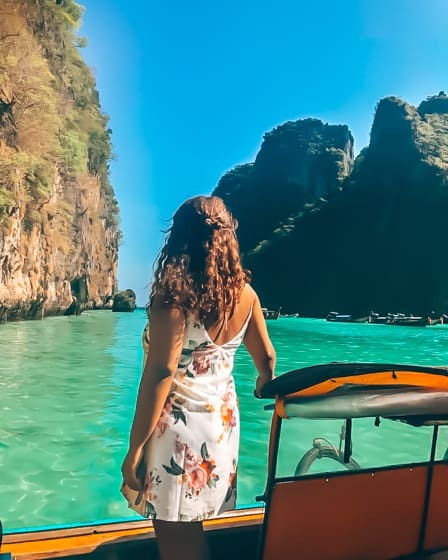 Check out my favorite tours to Hong Island and other surrounding islands in Krabi. If you plan to head to northern Thailand for more activities, make sure to read about having a truly ethical elephant experience with the Mahouts Elephant Foundation. 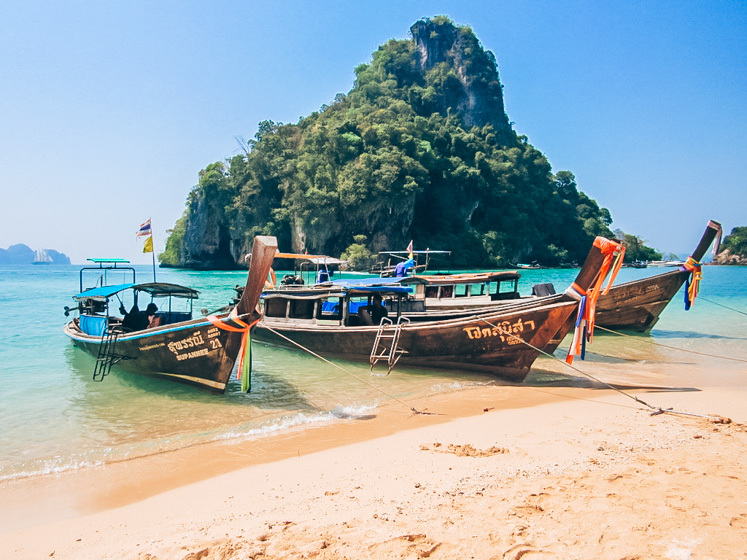 The day trip to Hong Island is one of the best things to do in Krabi. 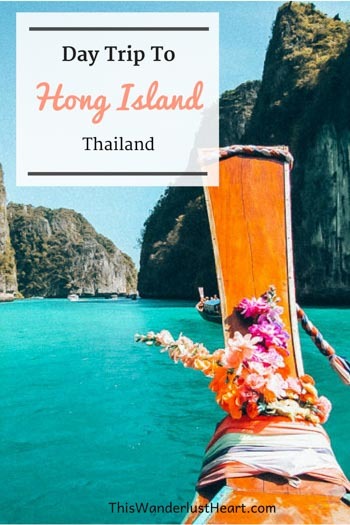 I hope I was able to convince you why you need to visit Hong Island on your next trip to Thailand! 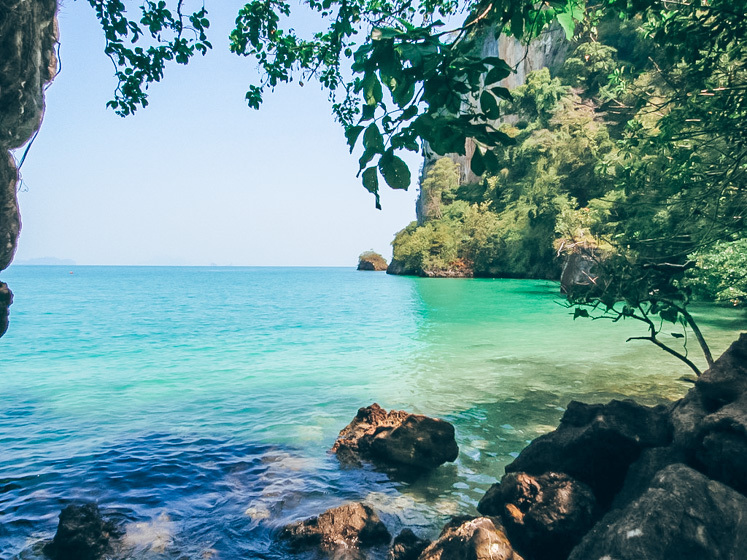 Let me know in the comments if you are planning a trip to Thailand soon! This is paradise on the Earth. The colors are simply amazing. Thank you for sharing your experience and information. I am working on some new Thailand post and I hope you enjoy that one as well! I should have seen your post earlier as I came back from Thailand few weeks ago and I was in this area too! The ? reminds me of Koh Lipe that is a bit southern! Love your photos! How fun! I’ve heard Koh Lipe is so beautiful too! Well there’s always an excuse to go back! Such stunning photos. I had not head of this island before. It seems much nicer and quieter than the others. Will deffo consider this place for my next beach holiday. Yes please do! I am sure you will love it! What picture postcard perfect shots. We have never been to Thailand, the azure sea is very enticing. We would love to take a dip and do some snorkeling. Gorgeous pictures, another location I have to add to my “travel bucket list”! Thanks for reading Anna! 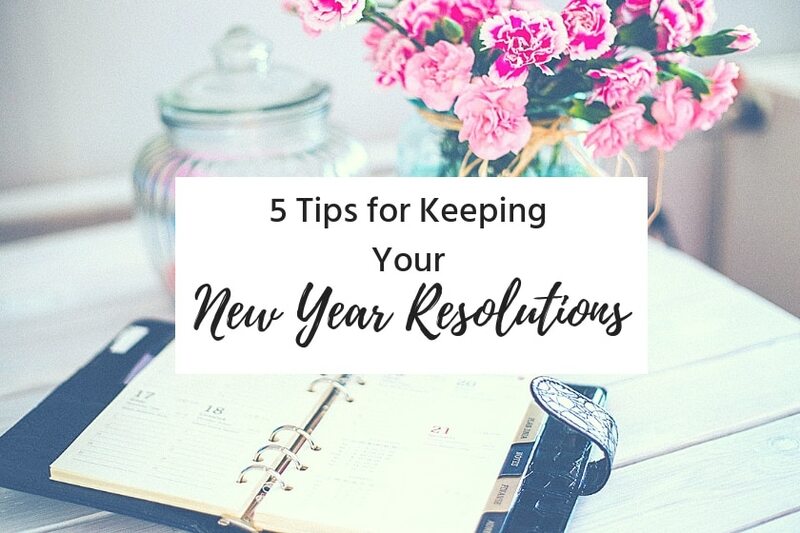 It should definitely be high on your list! Hey Anna. 18 months in Thailand? That sounds amazing. I’ve heard good things about Koh Phangan. Mainly the full moon parties haha! 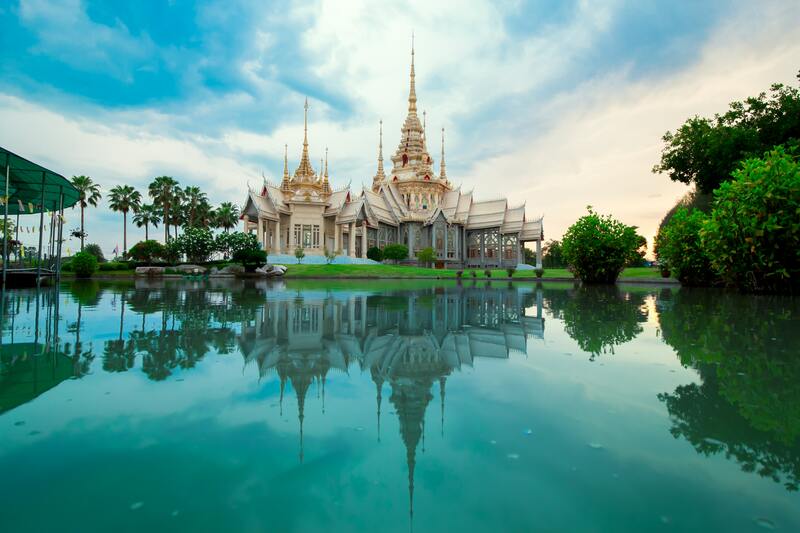 Thailand has been on my travel bucket list for years and I still haven’t visited! Hong Island looks so beautiful and peaceful! If I ever make it to Thailand, I’ll definitely take a day trip to this island. Hey Marissa! 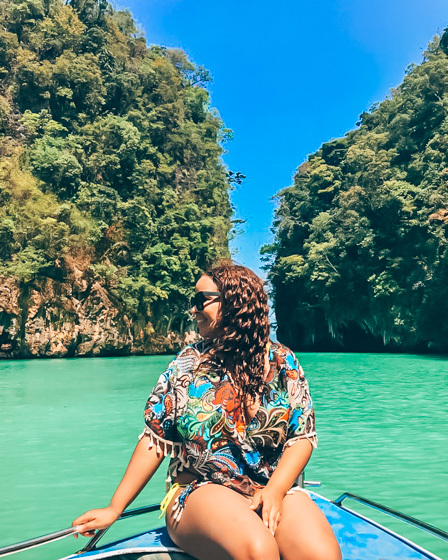 Thailand was on my bucket list for sooo long until I finally decided to go for my birthday this year. Hong Island was definitely such a gem to find and experience. I’m sure you’ll love it when you get to go! Thanks for reading! Oh I loved the Hong Islands – so beautiful. Your pictures are amazing! Now I definitely need to go back to Thailand. The Hong Island looks amazing! Hey Aurelia! Yes! Hong Island is definitely worth a visit! Thanks for reading!